Massive athlete from the Ukraine with tremendous upside. 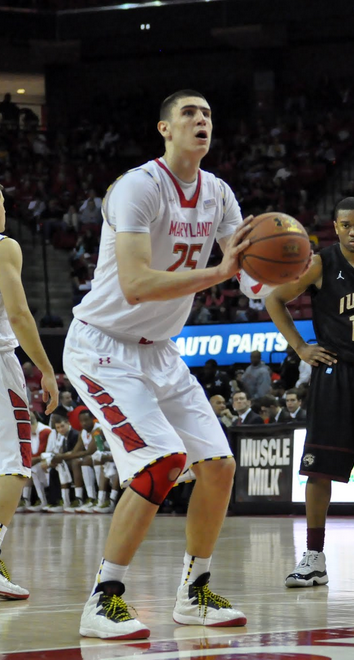 Has shown great improvement in his sophomore season for the Terps and now projects as a high lottery pick in 2013. Obviously, his size. Len has true NBA center size at 7,1 with long arms and decent strength. He is a very fluid athlete for a seven footer and shows good change of direction speed and excels at running the floor. Is developing a nice array of offensive moves and shows quick feet and good hands in the post. Can knock down a mid range shot but is at his best within 8 feet of the basket. A disciplined defender with good fundamentals on both ends of the court. Is not a great shot blocker but changes a lot of shots, defends the post well and usually avoids going for pump fakes and picking up silly fouls. Plays with a lot of passion and is a team first player. Does all the dirty work well, setting screens, rebounding and defending. Continued work on his free throw shooting is needed but he's already showing improvement and the potential to be a 70% to 80% shooter in a few years. Must continue to add strength to bang in the NBA.